Quicksilver Is A high energy film with excellent acting and a captivating storyline. 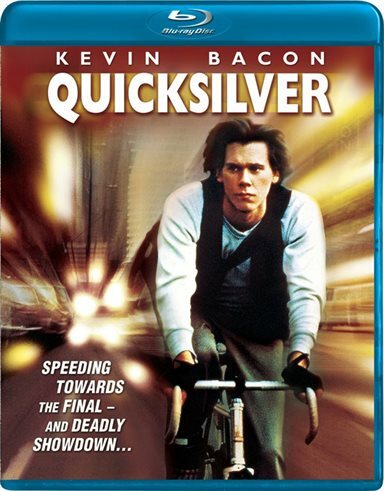 One of the best street action films of the 1980's Quicksilver has finally come to Blu-ray, but as far as quality of presentation it may be a bit too late. The movie was released in 1986 and filled the big screen with excitement and high energy. The bicycle riding scenes are spectacular and the story intriguing. I recommend the film for those who like speed, a bit of romance and a good crime story. The movie opens with young stock market day trader Jack Casey (Kevin Bacon) who has been making a name for himself. On this fateful day the hedges his bets and goes strong on a stock that ends up in the tank losing all his money, his parent's savings and his edge. Now at the bottom and since he has always had a love for speed on his bicycle he takes on a lowly job as messenger for a downtown San Francisco delivery company. He takes big risks slithering through the tough Frisco traffic, but it's like poetry in motion with style and grace. At the headquarters he's well liked and on her first day meets aspiring newcomer Terri (Jamie Gertz) who catches his eye. Already in a relationship, Jack tries to focus on his job even though his mind has already been distracted in her direction. When Terri finds herself in a fix, Jack finds himself risking everything again by going to her aid. Bacon's Casey turns out to be a great character for him to play showing off his young energy in this role that helped him continue his exciting career. Coming off films like Animal House, Friday the 13th, Diner, and Footloose he needed to hit a good chord with his public and Quicksilver did the trick. He puts his soul into the film by giving a heartfelt and mesmerizing performance of a guy who goes from success to failure and back again. What's paramount here however, is the character he develops that takes the hard road working out the challenges, focusing on his ride, yet not shying away from commitments even when his future lies in the balance. First time director Tom Donnelly does an extremely good job with his story and molds his actors into the characters that he intended when writing the piece. Taking young rising recognizable stars Jamie Gertz as Terri (Sixteen Candles), Lawrence Fishbourne as Voodoo (The Color Purple) and comedy favorite Paul Rodriguez as Hector (a.k.a. Poblo- TV) he makes them pivotal points to his story gambling on their rising popularity. The choice wins here, although the film runs into a boxoffice challenge going up against Nick Nolte in Down and Out in Beverly Hills, Goldie Hawn's Wild Cats and the second weeked of Steven Spielberg's Color Purple. Quicksilver may have suffered another problem and that's in the ratings race. It was judged a PG rating by the MPAA, but in those days that's the kiss of death as the subject matter was not geared for the younger crowd all though the rating points it in that direction. Truly a PG-13 with its violence, brutality and language, the rating would have helped the box-office by attracting the much older audience that the film deserved. The film video quality on Blu-ray has suffered from decay of the original print showing a lot of grain and blur at times. Although this does affect the presentation somewhat, it doesn't detract from the performances by the cast and the absorbing storyline itself. The sound quality is clear and clean and so much so, you can hear the wiz of the bicycle wheels as the riders put them through their paces in the streets of San Francisco. The surround sound picks up all the side action and special sound effects adding a theater quality that's important to the film's presentation. The power of DTS-HD Master Audio here is well served. The musical sound track takes you back to the 80's with some awesome tunes of yesteryear while the cycles spin wildly though tight spaces and dangerous intersections, it's an extra treat. Download Quicksilver from the iTunes Store in Digial HD. For more information about Quicksilver visit the FlickDirect Movie Database.